Intel AppUp is Up, but underwhelming. 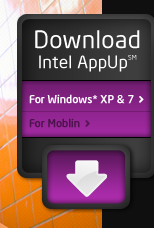 Intel has launched AppUp, its application store for Windows and Moblin/MeeGo Linux. 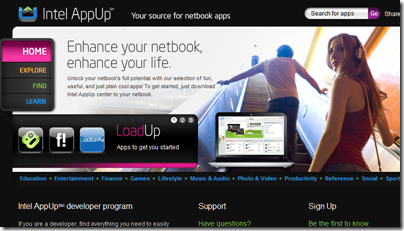 The Intel AppUp developer program will support MeeGo. 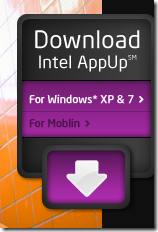 The current Moblin SDK for the Intel AppUpSM developer program is MeeGo ready and is upward compatible for Moblin and MeeGo. The web site is pretty confusing, even though it is supposedly out of beta. Click Frequently Asked Questions, and you get a document dated December 2009, though “Last Modified” in August. It does seem to be out of date though, referring throughout to the Beta and stating that only Windows is supported by the AppUp client. I downloaded the client and had a look. The client is a simple affair, with apps in various categories, though the current selection of apps is uninspiring. Prices currently range from free to £28.19 for Easy Flyer Creator (Desktop Publishing), the most expensive I could find. 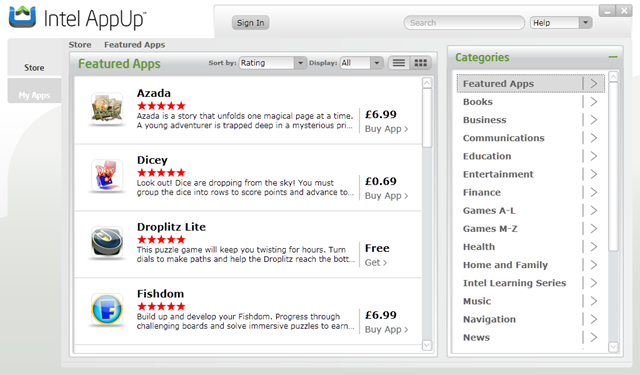 All the “Featured apps” are games, though the other categories are populated to some extent. If you want to develop for AppUp you need the SDK, which provides the tools and libraries to link your app to the AppUp client. The SDK is native code, and the natural developer platform for AppUp is the cross-platform Qt, but the main requirement is that you can link to the SDK; there is also an approval process. Melrose provides a repository that distributes applications to multiple application stores so that publishers can reach millions of users. Intel AppUp Center and the Adobe AIR Marketplace are the first two storefronts available in Melrose. Melrose also provides analytics that let publishers measure success of their applications. It is a shame that Melrose does not yet include Android Market. 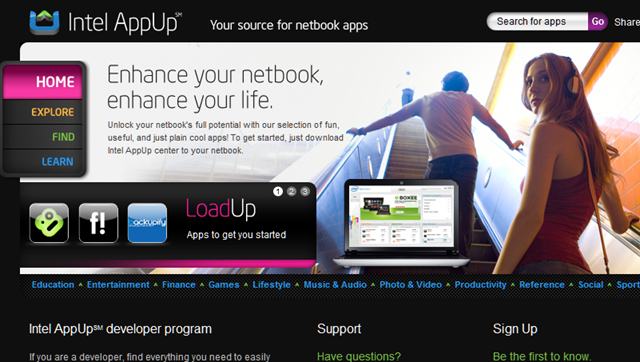 Who knows, AppUp may have a bright future, but Intel could have done better with the launch. There is a poor selection of apps, confusing Moblin/MeeGo branding, and out of date information on the site. Of these, the biggest problem is the lack of apps themselves. The main target is netbooks, and Intel will need a greatly improved selection before AppUp comes close to enhancing netbooks in the way that Apple’s App Store enhances iPhone, iPad and iTouch, which is the obvious model. How many app stores will there be? Alongside Apple, there is AppUp, Nokia’s Ovi, Android Market, as well as older app stores like handango. Microsoft is rumoured to have big plans for an App Store for Windows 8, and of course Windows Phone 7 will have its own store – and these are just the ones which come to mind immediately. 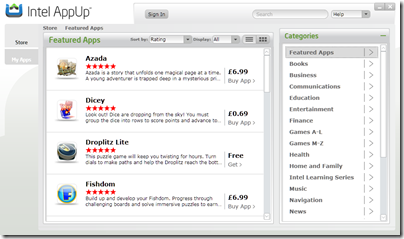 Not all these app stores will succeed, and Intel should have made more effort with this launch. Just @ the MeeGo session at Sprint Devcon (led by a manager – who apparently has no idea that the implementation of AppUp doesn’t actually officially support Meego just yet) – appup.com today is still showing Moblin and Win 7 only. Has anyone tested if the SDK is actually MeeGo compatible?